Asian countries have become the main importers of Russian military equipment amid sanction imposed by the US. India, China, and Iraq have received the most weapons and military equipment in 2014 from Russia’s state-run Rostec company, according to the company’s annual report published on Wednesday. “The deliveries of military equipment were sent to 59 countries. The company’s main importers were India (25 percent), China (22 percent), Iraq (22 percent), Syria (5 percent), and Venezuela (5 percent). 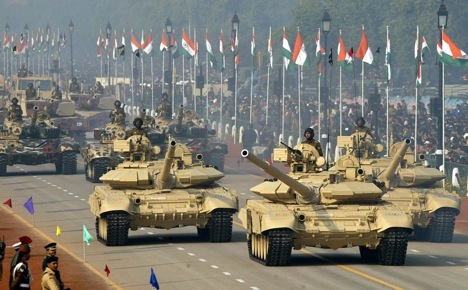 Geographically, the main exports of military equipment went to Asia (75 percent), Latin America (9 percent), and the Middle East (7 percent),” the report shows. The company’s annual report also reflects that military exports to the former soviet republics have drastically dropped to $370 million in 2014 from $1.5 billion in 2013. The company fulfilled 9,400 contracts in 2014; that is 54 percent more than in 2013. However, western sanctions against Russia have raised Rostec's subsidiaries and could diminish the attractiveness of the corporation's projects for investors, the same report read. "Sanctions imposed by Western countries against the Russian Federation in relation to the Ukrainian crisis inevitably affected the corporation and its organizations. The sanctions are not aimed to affect the corporation but its subsidiaries, since the corporation receives no funding from abroad. The sanctions could harm investment attractiveness of the corporation's projects and the capitalization of its brand, as well as Rostec's profit received from the subsidiaries' shares and stocks," the report said. The corporation, which deals with hi-tech industrial products and military arms and equipment, noted that US sanctions specifically prohibited US citizens and legal entities from making any new financial transactions and provisioning new loans to Russian (citizens and legal entities) for a period of more than 30 days. "This prohibition applies to all the subsidiaries in which the corporation has, alone or together with other persons included on the sanctions list, with more than 50 percent of shares," the report said.